I just wrote a question on Stack Overflow. Now I was thinking if it would be a good idea to include the full stacktrace to the error or just the error message. 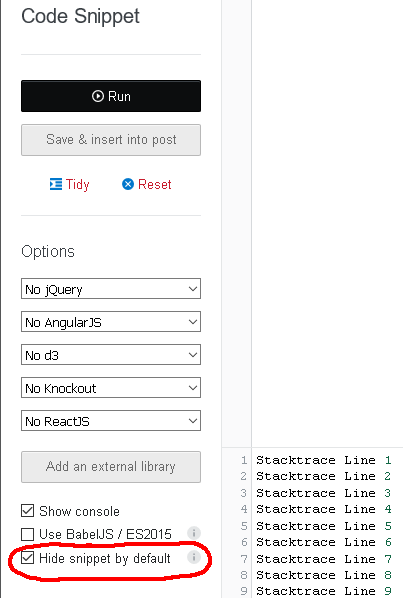 From my point of view, the stacktrace would not add much more helpful information and it was about 30 lines long, so I choose not to post it. and if I click expand the full code would be shown. expand could be either true, false or auto where auto would expand the code on desktop and hide it on mobile. Large code blocks are already shown smaller than they are. This could be modified slightly and leveraged to solve the problem of "unimportant code block is too large" without asking for a brand new feature. once it passes 40ish lines, it becomes a scrollable block. Having the option of a smaller window would probably solve your problem almost as well (say, 10 lines).